I’ve known Amanda for several years. We met through My Book Therapy at the 2012 Deep Thinker’s Retreat. Her name tag labeled her as “AJ” and since then, that’s what I’ve called her. She’s such a sweet person, who writes amazing stories. As a child, Amanda G. Stevens disparaged Mary Poppins and Stuart Little because they could never happen. Now, she writes speculative fiction. 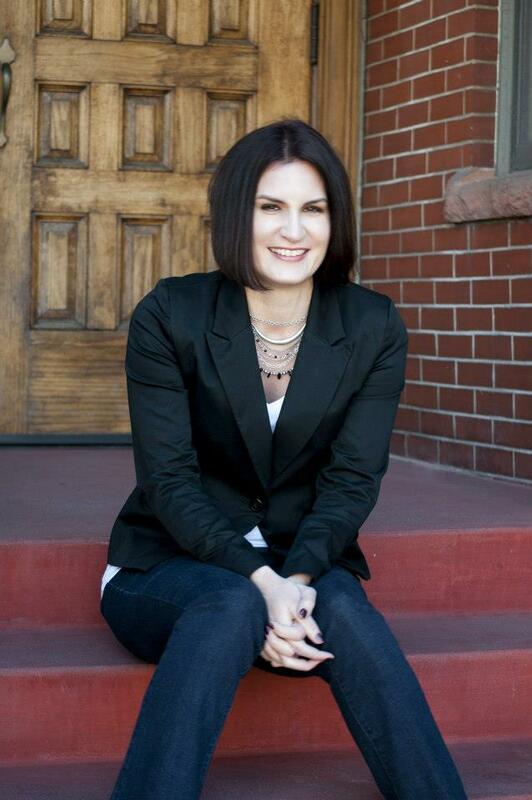 Holding a Bachelor of Science degree in English, she has taught literature and composition to home-school students. She lives in Michigan and loves books, film, music, and white cheddar popcorn. 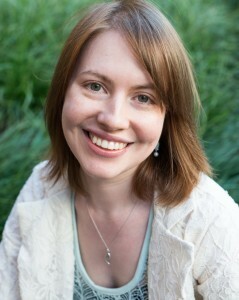 Find her on my website, Twitter, Facebook, and of course the book lover’s time-sucking paradise: Goodreads! My writing space is my living room. I alternate between my couch and my chair, which is one of those oversized, not-quite-loveseat things; I can take a nap in it if I curl up a little. Sometimes in the middle of a scene I’ll move from one piece of furniture to the other for no discernible reason. They’re only about five feet apart, so I don’t know why it matters. It looks so cozy and comfy. What makes it special for you? My aquarium. Sometimes when I’m stuck, I’ll brainstorm while staring at my fish. 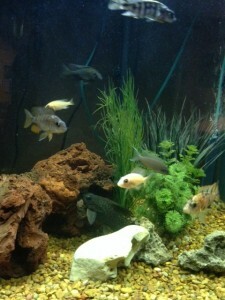 They’re cichlids, high energy and aggressive; drifting peacefully is rarely their thing. It makes them entertaining to watch. 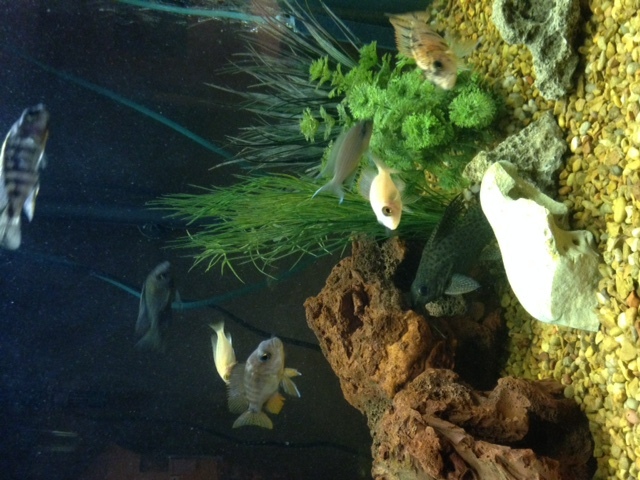 We used to have an aquarium when our boys were younger. Fish are so relaxing to watch. What is one element of your space that makes you smile? See above, I guess? My living room is pretty unremarkable otherwise. 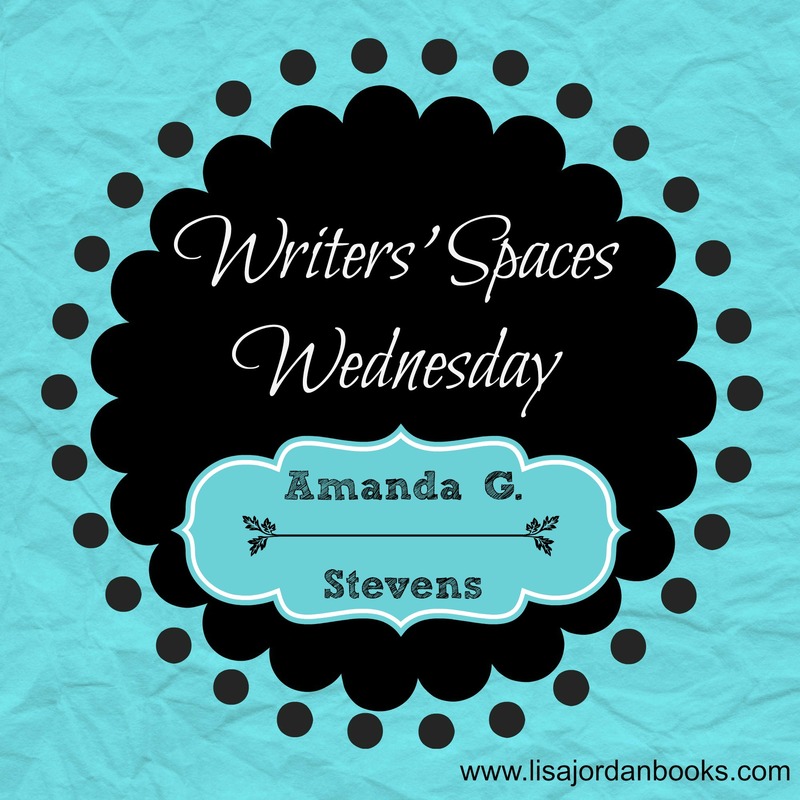 What are your “must-haves” when you sit down to write? This time of year, fuzzy socks and a throw to keep me warm. If I’m sleep-deprived on a deadline, I make sure to have a Starbucks Frappuccino (mocha or vanilla). With the winter we’ve been having, I’m so with you on the fuzzy socks and throw. Share a typical writing day. As someone who maintains a full-time day job, I understand how limited your writing time is. I’d be a zombie if I stayed up that late, though. 🙂 If you could choose the ultimate writing space, where would it be? 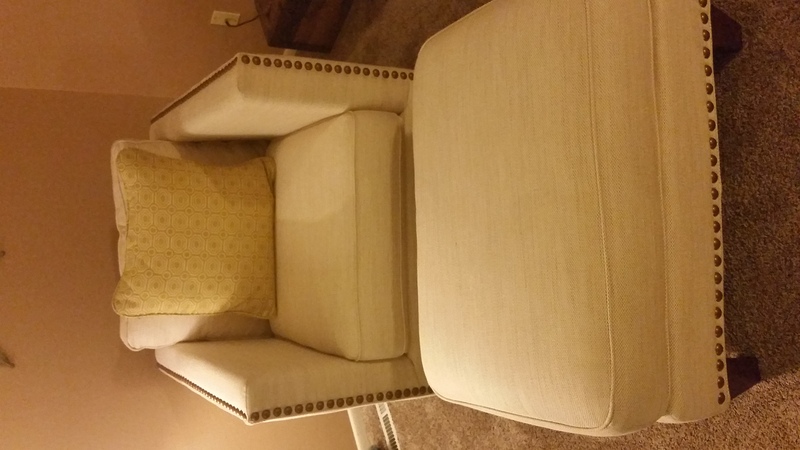 Someday soon I hope to find a modern, comfortable sleeper chair for my library, so I can alternate that space with my living room. I love being surrounded by books I have read and want to read. David Quammen describes books as “the most comforting sort of intellectual wallpaper,” and they are that for me too. If we’re letting me design a fantasy writing space, then it would have my aquarium and my books in the same room and it would be located in a perpetually mild climate so I could always have the window open. Your ideal space sounds so inviting! Tell us a little about your latest release. 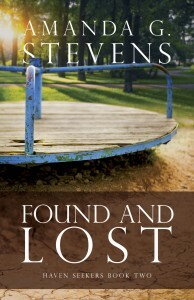 In Found and Lost, we meet Clay Hansen—husband, father, lover of literature, questioner of God. And we meet Violet DuBay—a teen girl who’s grown up in this world and is forced to question it for the first time in her life. 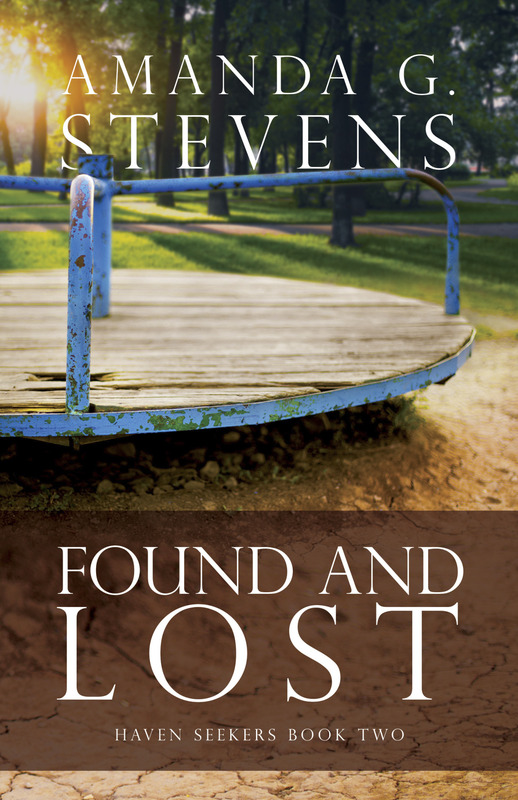 Amanda’s note: Haven Seekers is a series in the traditional sense (i.e. a serial plotline) so should be read in order. AJ, thanks so much for inviting us into your writing space today. I’m so excited about your writing career. Readers, what are your “must-haves” when you curl up with a good book? Jill Lynn is a fellow Love Inspired author whose debut novel, Falling for Texas, is on the shelves this month. Jill and I are Facebook friends, who met in person at last year’s ACFW conference. She has the most amazing smile. 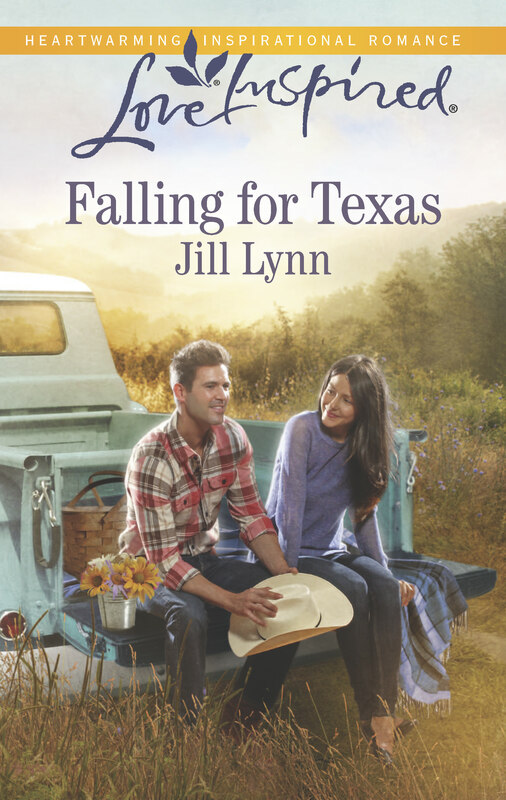 Jill Lynn writes contemporary inspirational romance for Harlequin Love Inspired, with her first book, Falling for Texas, available now. 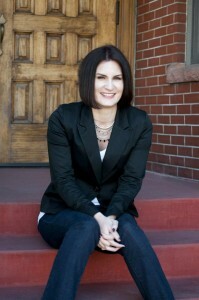 She has a Bachelor’s degree in Communication from Bethel University and is a member of American Christian Fiction Writers. 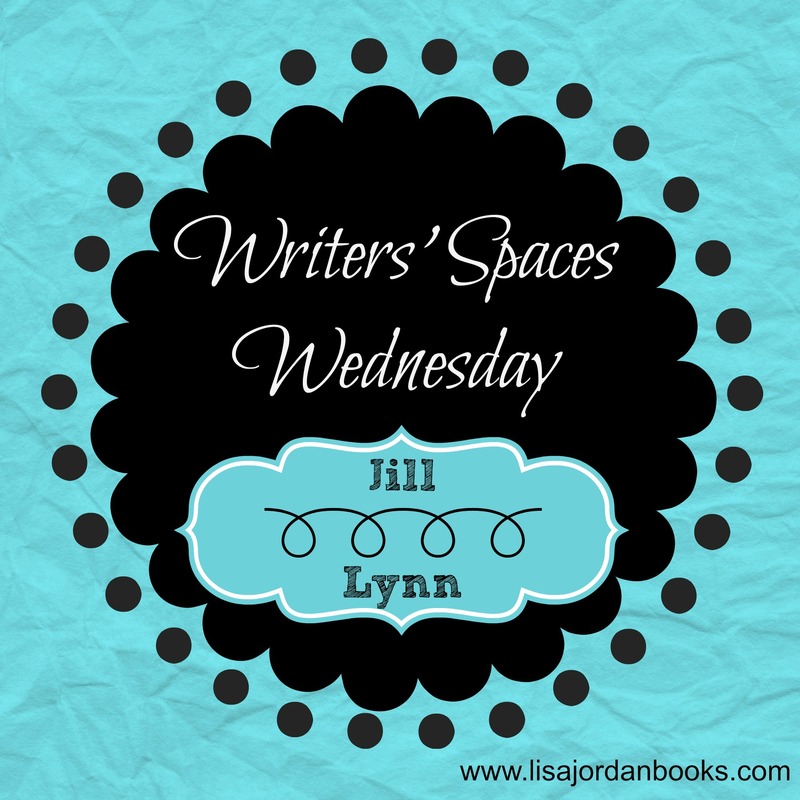 In 2013, Jill won the ACFW Genesis award. She lives in Colorado with her husband and two young children and has a penchant for great books, boots, and thrift stores. Connect with her at Jill-Lynn.com, on Twitter, Facebook, Instagram, and on Pinterest. 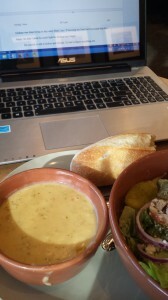 I’m usually running errands or popping into school for various kid’s activities, so I often write at Panera. That way, I’m not wasting time driving home. Although, I am forced to eat food like this… and that is a hardship. That looks fabulous. I can see why you like to hang out here. What makes it special for you? 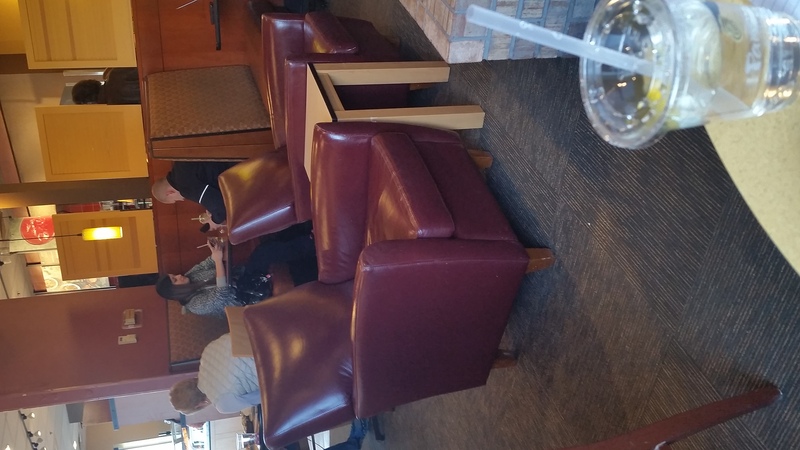 Panera has all the comforts of home without any of the distractions… a nice arm chair, which I prefer. A fireplace. And no temptation to do laundry or clean like I’d have at home. Okay, I probably wouldn’t really be tempted, but it’s a nice thought. I want to curl up in one of those chairs with a cup of tea and a good book. What is one element of your space that makes you smile? Food, food, food. Did I mention I like food? And coffee. 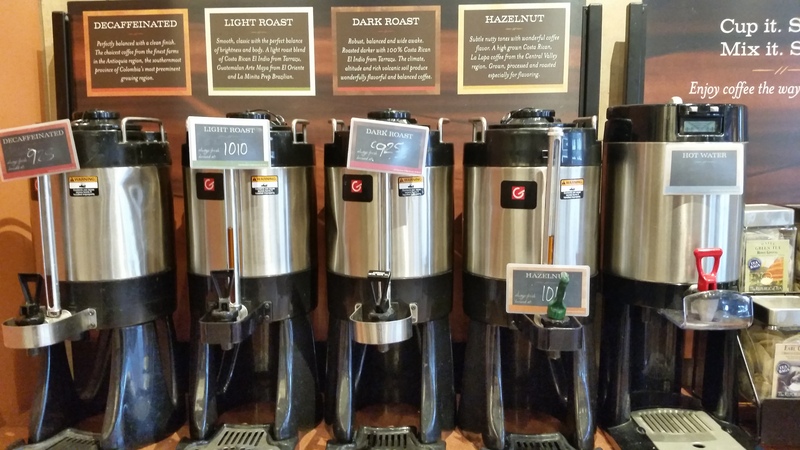 It’s a virtual coffee buffet. Dark roast. Light roast. Decaf. 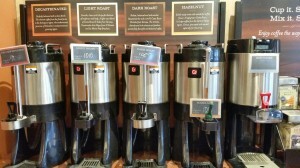 Sometimes when I’m feeling really crazy, I mix decaf and regular. I’m a wild child. Did I mention coffee? That and my laptop are pretty much the only things I need to dive in. Headphones are a plus for when I need to drown out annoying Panera conversations around me. And water. I love water. 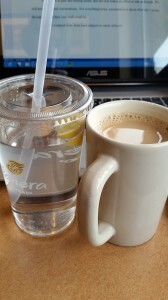 Lately, I’ve been asking for the larger water cup at Panera. They just smile at me like I’m in some kind of super cool club. Which I pretty much am. The water drinker club. With a twist. And by that I mean a lemon. I’m a bottle-carrying member of the water club, too…with a twist of lemon. Share a typical writing day. First I drive the kids to school. 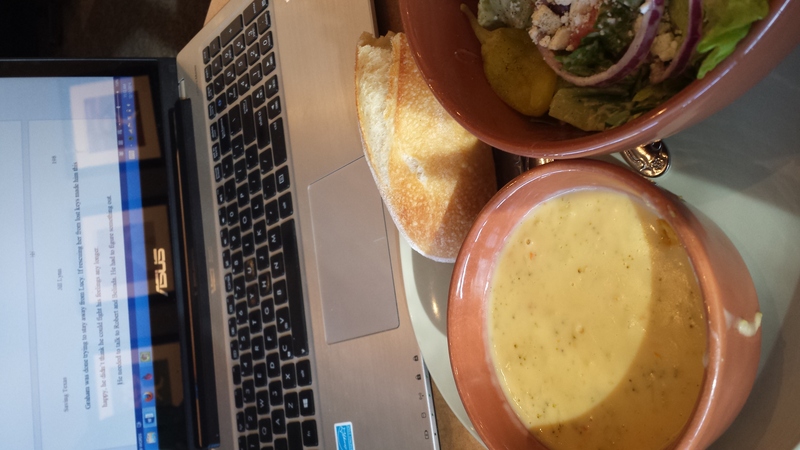 If I need to be out and about during the day, I head over to Panera and start working, squeezing in whatever time I can until the next activity calls me. On days I have open, I head home to write. We don’t have an office, though we’re hoping to remedy that by combining one with our guest room. If I’m home, I write in the living room. I do actually pick up the kitchen and throw in a load of laundry on these days… most of the time. 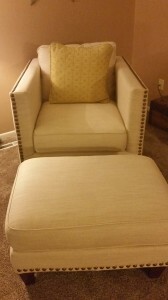 I have a very similar chair and ottoman in my living room where I write…usually with my dog on my lap. If you could choose the ultimate writing space, where would it be? I’d love an attic space that’s been transformed into a writing nook. 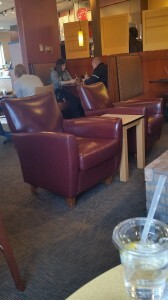 Wood floors, a great comfy chair, slanted ceilings, and a nice window seat. I don’t ask for much. My dream is to transform our attic into my writing space. It has most of those things, but it needs heat! Tell us a little about your latest release. Falling for Texas is about a Colorado girl who moves to Texas hoping to leave the past behind. She agrees to tutor one of her volleyball players, and the girl’s older brother captures her attention. Despite both of their attempts to keep things at friendship level, their stubborn hearts tumble toward love. 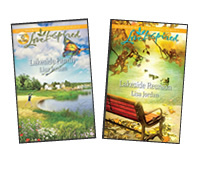 Falling for Texas on Kindle & Nook. 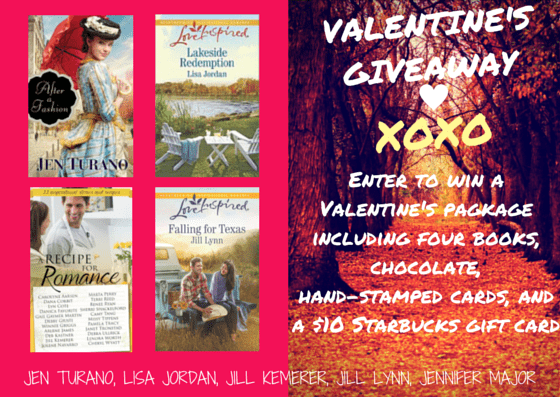 As I posted on Monday, I’m teaming up with fellow Love Inspired authors Jill Lynn and Jill Kemerer, fellow Books & Such client Jennifer Major, and romance author Jen Turano for a Valentine’s Giveaway. The contest ends at 1:00 AM EST on 2/14/15! Get your entries in today! 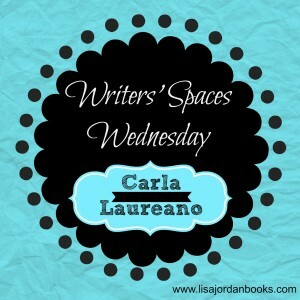 I invited my friend Carla Laureano to share about her writing space and a typical day for her. I “met” Carla through a Facebook group we’re both a part of, but after reading her debut novel, Five Days in Skye, I knew I needed to meet her in person. That happened this past September when I rudely interrupted a conversation she was having with a writer/book reviewer so I could introduce myself and get a long overdue hug. In addition to being a very sweet person, she’s a gifted writer. Carla is the author of the Celtic fantasy series The Song of Seare (as C.E. 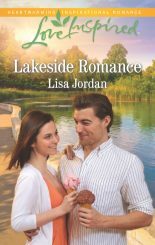 Laureano), as well as the RITA® Award winning romance Five Days in Skye. She’s an avid cook, an enthusiastic but untalented singer, and a thwarted world-traveler. 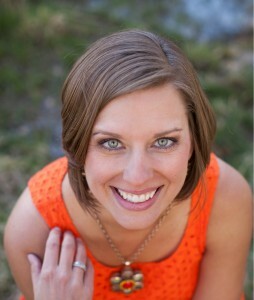 She currently lives in Denver with her patient husband and two rambunctious sons. 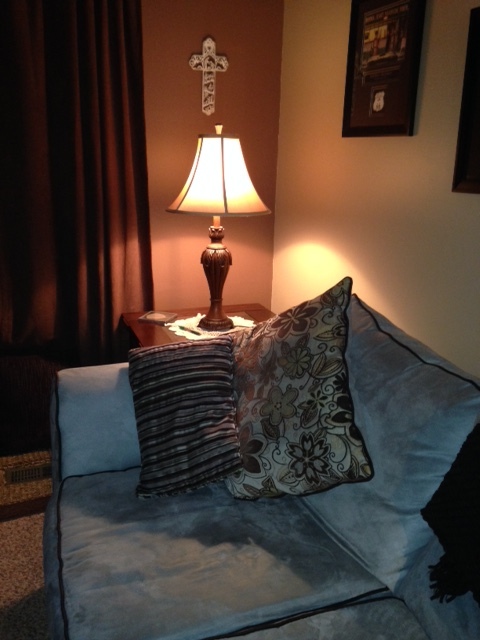 When we moved into this house, my office was in our finished basement, but in the winter, it is freezing! 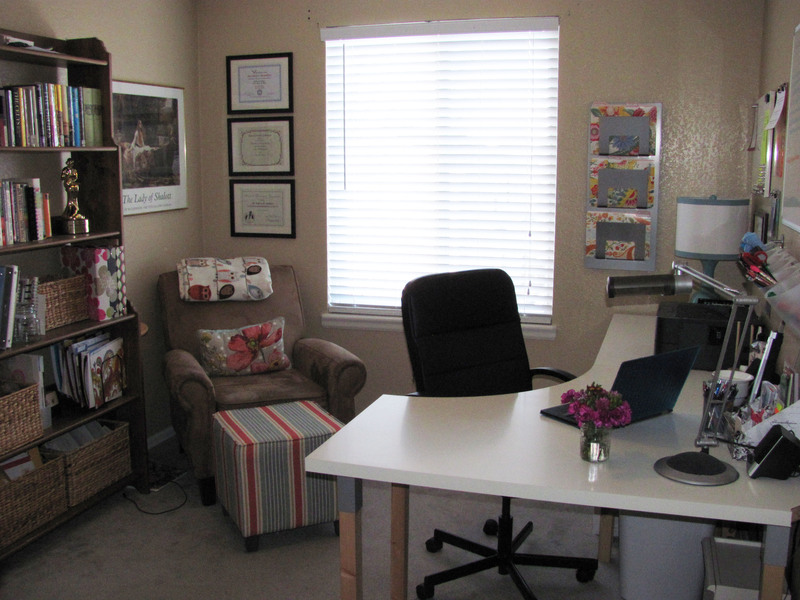 Last year, when my two boys decided they wanted to share a room, I took over my youngest’s bedroom upstairs and turned it into a writing space. Win for you! Basements can be way too cold. What makes it special for you? Besides the fact it’s warm? Just kidding. I love the fact I have a room big enough to incorporate my favorite books and art prints, a dedicated space to work, and a comfy chair for research reading or reviewing galleys. Plus, now my sons’ parakeet has joined me, so she won’t be lonely while they’re gone. Your office is gorgeous. What is one element of your space that makes you smile? My accent colors make me happy! I recently decided I needed a hint of spring with all the tan and white, so I bought a cheery ottoman and pillow…and then found some file folders printed with reproduction silk patterns in the same color. I feel so cheerful whenever I walk into my office decorated in shades of coral and aqua and yellow. I love your colors. That ottoman is gorgeous. 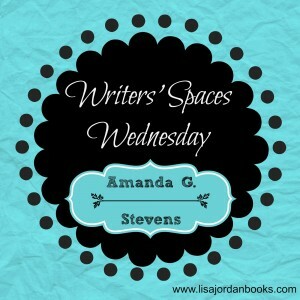 What are your “must-haves” when you sit down to write? Something hot to drink on my mug warmer, water with a slice of orange in my favorite cup, my planner (to jot down things I need to do so I’m not tempted to get up when I’m supposed to be writing), and my laptop. Depending on where I am in the writing process, I might have a stack of reference books, too. Music is optional. Sometimes I can’t write without it; other times, it’s too much of a distraction. I drop my kids off at school across town first, so by the time I get home, it’s about 8:45. 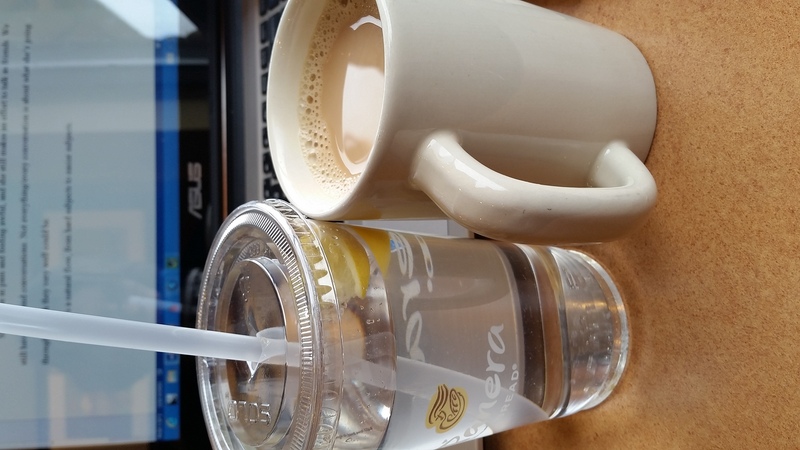 I make coffee or tea and get myself settled at my desk, where I let myself check in with my writer friends about their plans for the day (my version of water cooler chat). I try to get down to work by 9:15 or 9:30 and then write until 1pm when I break for lunch. Then it’s back to work (often promotion or social media) until 3 when I need to leave to get the kids. This only gives me about six hours in a work day, so depending on my deadlines and commitments, I typically work another hour or two after my boys go to bed, usually emails, social media, or blog posts. When I’m fast-drafting a book, I only let myself call it a day after I’ve gotten my word count in—which is usually about 2000 words—regardless of whether that takes me two hours or twelve. You seem very organized and disciplined with your time. If you could choose the ultimate writing space, where would it be? Those tiny homes are adorable! Tell us a little about your latest release. Beneath the Forsaken City is the second book in my Song of Seare Celtic fantasy series. 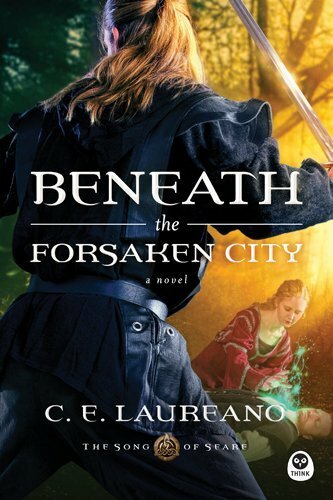 My protagonists Conor and Aine have just barely escaped Seare with their lives, but they are quickly thrown into as much danger as they left behind. Meanwhile, things back home become increasingly dangerous as their enemy seeks to destroy anyone who can stand against him. I’m told by early readers that this book is non-stop action with lots of surprises… which is possibly the best compliment I can get! 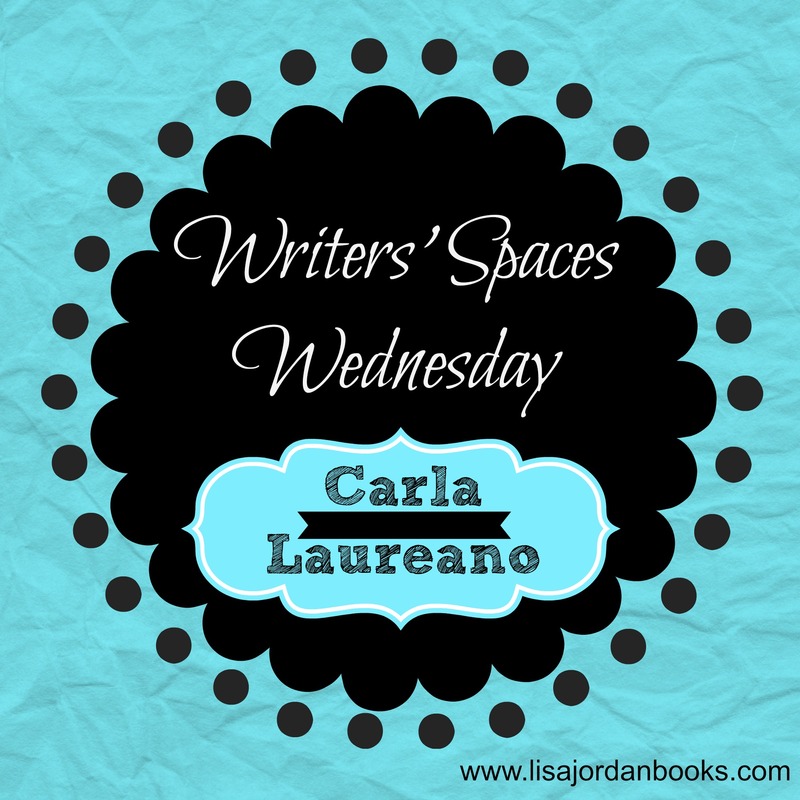 Carla, thanks so much for giving us a peek inside your writing world. I’m so excited to see how this year unfolds for you! Readers, what aspect do you find most fascinating by a writer’s life? 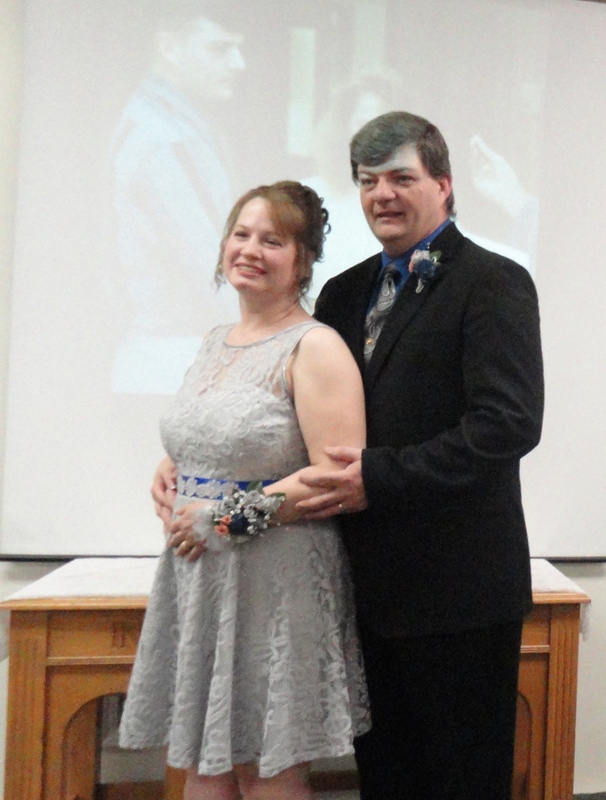 This past October, Hubby and I celebrated our 25th anniversary by renewing our marriage vows in front of family & friends at our church. We chose to renew our vows for one simple reason–we wanted to reaffirm those promises we said so many years ago…years that have been shaped, refined and molded by laughter, by tears, and by standing together to face the many challenges that came our way. Our courtship was quite unique. We met in May 1988 when Hubby came into the family restaurant where I had been working as a waitress for the summer. The moment I saw him, I knew my life was about to change. He had a presence about him and the way he carried himself that exuded confidence…he still has it. We became friends, and we communicated long distance for a couple of months by writing letters. Then he came home on leave, and we started dating. By that time, I was so in love with this man who made my heart swoon. I knew he was the one I wanted to spend the rest of my life with. We talked about a traditional wedding, set a date, and started making plans,. I even picked out the most beautiful wedding gown. Then we realized we didn’t want to want another six months to get married. We chose to elope three weeks after getting engaged. 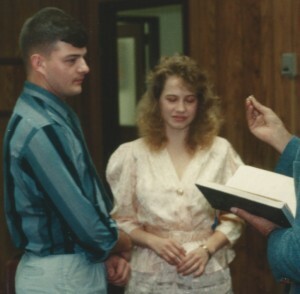 I wore peach, he wore gray, and we promised to love, honor and cherish one another in front of a judge, two friends, and the judge’s secretary. I tell people it may not have been my dream wedding, but I married the man perfect for me. Like most married couples, our relationship hasn’t always been the fairy tale. We experienced challenges that could have broken us, but we refused to give up. Instead, we worked hard to turn those trials into triumphs. We’ve used the life lessons from our mistakes to help us to become a stronger couple and better parents to our incredible sons. The beauty of the past twenty-five years is knowing the young love we first shared has matured into a deep-seated devotion that will outlast anything life hurls our way. Each day I spend with him is an incredible gift, and I’m so blessed. I’m teaming up with fellow Love Inspired authors Jill Lynn and Jill Kemerer, fellow Books & Such client Jennifer Major, and romance author Jen Turano for a Valentine’s Giveaway.